In the predawn hours of June 30th, a burglar broke into a San Francisco dental office (twice within 3 hours!). He made off with some cash, several thousand dollars’ worth of equipment and a tablet computer. This is a success story because the office was able to remotely erase the tablet. That wasn’t luck; that was preparedness. Preparedness—enabling remote wiping of that tablet—prevented a data breach. Even if any of your sensitive business data lives in paper files, these five actions can help prevent data breaches in your company. 1. Restrict access to files. Locking filing cabinets and storage rooms dedicated to files (not shared with office supplies or other items) allow employees to see and handle documents only on a “need to know” basis. Keep a record of who has access where. Change lock combinations or access codes regularly. Mandate that keys and codes are never shared. 2. 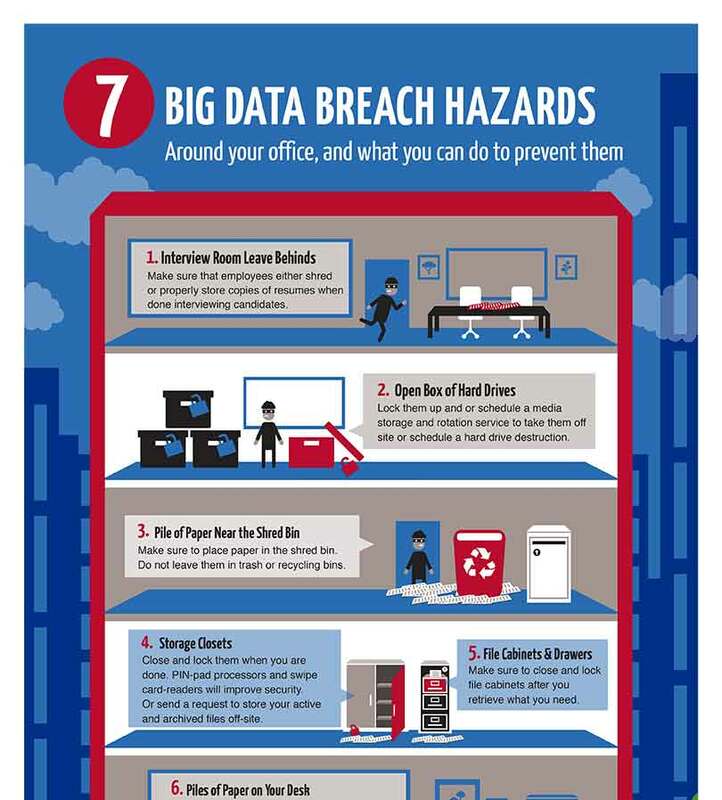 Make data breach protection everyone’s responsibility. If your business relies on paper records to any extent, document shredding by all employees is your first line of defense. Make your employees aware of the need for shredding from the moment you hire them until the day they depart. Explain clearly that they have accountability for data breach prevention. Review and re-train on your data leak security measures regularly and often. Task managers with regular walk-throughs of workspaces and common areas to ensure employees are following your security protocols. And yes, shuffle through recycle bins to check for sensitive documents that should be shredded. 4. Always move files with care. It doesn’t matter whether someone is scanning a folder full of employee records or carting a dozen file boxes to a new storage area. When files move, they can be lost or stolen. That’s where active paper document storage can help: Your documents are stored off-site, but they’re readily accessible for in-office use. 5. Clean house every month. Make it a company-wide event. All employees sift through their papers and choose from three options: scan, shred or store. But it can’t be random: With a business document retention schedule in place, everyone can always make informed records management decisions. Remember, the businesses that protect themselves from a potential data breach are the businesses that nurture a “culture of data security.” In those companies, data security is part of everyone’s job, every day. When all’s said and done, the very best protection against data breaches is off-site records storage of your paper files by an insured, reputable records management firm. Corodata, for example, takes away your worries about data leaks with plenty of secure storage space, restricted access to your files, an audit trail, secure shredding at the end of your records life cycle, and more services that let you focus on your business.